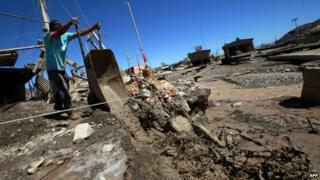 Rescue workers in Chile say the death toll from last week's floods has risen to 25 and could increase further. There is growing concern for the 125 people still missing after last week's flash floods and mudslides in the Atacama region, which includes the world's driest desert. President Michelle Bachelet visited the area on Saturday, promising to provide aid to help recovery efforts. Chile's emergency services say about 2,700 survivors are now homeless. Sniffer dogs are being used to try to find people who may be trapped under the mud, which swept down from the Andes mountains in torrents and is now hardening under the desert sun, the BBC's Chile correspondent Gideon Long reports. About 30,000 people have been affected by the floods - the worst in the Atacama region in 80 years. With much of the area caked in thick brown mud, and littered with rocks and trees washed down from the mountains, it will be weeks - if not months- before the region recovers, our correspondent adds.